Wyoming Dream (“Dreams”) is an apparently healthy, 17-year-old Quarter Horse mare. She received 3 acupuncture treatments on July 20, 22, and 30th. Myofascial examination revealed stiffness, decreased range of motion, fascial restriction and reactivity associated with her neck (C 2/3) on the right side, both shoulders bilaterally, proximal lumbar spine, and middle gluteal muscles. Intermittent, left front lameness has been noted as well as resistance to turning or bending of her neck or back while on the ground or under saddle. Girth sores are present bilaterally, suggestive of poor saddle fit. The first treatment was performed over 15 minutes and utilized two 0.20x 30 mm Seirin needles in GV 14 and Bai Hui, and two 0.25 x 30 mm Seirin needles in GB 21 bilaterally. The second treatment was performed over 20 minutes and utilized 0.30x 30 mm Seirin needle in GV 14, 0.25 x 30 mm Seirin needles in GB 21 and BL 13 bilaterally. One 0.20 x 30 mm needle was placed in Bai Hui. Dreams was less amenable to the third treatment and was very excited due to the level of activity happening around her home. During the third, 10 minute treatment, one 0.30x 30 mm Seirin needle in GV 14, 0.25 x 30 mm Seirin needles in GB 21 bilaterally and one 0.20 x 30 mm needle was placed in Bai Hui. There was mild improvement regarding patient reaction to trigger points and range of motion. This could be further improved by an increased number of treatments over a longer period of time, and addition of electrical stimulation or laser therapy to more effectively target the area. Dreams responded positively to the first and second acupuncture treatments and was simply excited and distracted during the third resulting in a more limited session. As numerous examination findings are secondary to poor saddle fit, the most impactful and longest lasting change which should be implemented in this case includes a modification of saddle fit. Wyoming Dream is a 17-year-old Quarter Horse mare. Dreams is presenting with no specific complaints and is apparently healthy. She is eating and drinking normally with normal urination/defecation and no diarrhea/coughing or other concerns at presentation. She is used for guest trail rides at a dude ranch in Southwestern Wyoming. Saddles are generally fit to guests rather than horses and numerous saddles are used on her monthly. She is housed in a large fenced field with approximately 10 other horses. They eat free choice grass hay throughout the summer months and have access to running water and a salt lick. The horses are housed closer to town during the winter due to inaccessibility secondary to snow during the winter. During that time, they are fed grass hay (free choice), have access to melted water and have a run they can shelter in. She has an unremarkable veterinary history and, due to her housing situation, has some bites/scrapes/old scars. She gets her teeth floated annually and is shod approximately every 6 weeks. Her owner is interested in acupuncture and potential introduction of the modality into the herd. Eyes-Ears-Nose-Throat: Eyes clear, no ocular or nasal discharge bilaterally. Cardiovascular: Normal rate/rhythm. No murmur noted on cardiac auscultation. Respiratory: Normal rate/effort. Clear lung sounds bilaterally. Dental-GI: Normal borborygmi in all 4 quadrants. Rectal examination not performed. Integument: Girth sores are present bilaterally- two ~1 x 1 cm circular, erythematous lesions/abrasions present in left axilla and hair loss from cinch contact is noted dorsal to the lesions. Her left axillary area has numerous alopecic areas which are erythematous and located in the area of the cinch. Caudal to those, is a white hair patch indicating previous scaring in an area associated with more caudal girth placement. 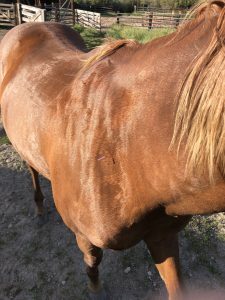 Numerous scars are present- assumedly from pasture with other horses over time- one, 2 cm hairless abrasion present on her right caudo-lateral abdomen. Another scar and muscular defect is present distally on the left side of her neck- in the brachiocephalicus muscle. A ~2cm hairless abrasion is present on the right dorsal scapular border. Musculoskeletal: Good skin and hair coat. Normal digital pulses. Soft, raised ~1.5” x 1.5” oblong mass on left medial gluteal m- not reactive on palpation. Mild tarsal swelling bilaterally. Neurologic: Normal mentation. Normal proprioception. Intact palpebral reflex. Normal menace. Myofascial examination: Palpation of the TMJ and other facial muscles/joints was unremarkable. Tense bands were present running along the brachiocephalicus muscle bilaterally. She was reactive to palpation associated with 2nd and 3rd cervical vertebrae on the right side. Dreams’ neck range of motion (ROM) was decreased both left and right but was more limited turning right with carrot stretches. She did not exhibit reluctance or limitation moving her head up or down. Dreams’ shoulders displayed reactivity, fascial restriction, and taught muscle bands associated with her dorsal supraspinatus muscle (bilaterally), infraspinatus muscle (dorsal aspect- with left being more reactive than right when palpated), as well as trapezius muscle bilaterally. The long head of her triceps had specific trigger points -proximal end of long head bilaterally- but was worse on the left than the right. She was repeatedly reactive bilaterally by her girth sores (ventral thorax) and proximal to the direct injury (involving the serratus ventralis muscle). Her back was sensitive to palpation throughout and her iliocostalis and longissimus muscles were very tense with fascial restriction. She was reactive just proximal to Bladder 13 (approximately 7-8th ICS between longissimus and iliocostalis mm) with the right side being worse than her left side. Bilaterally, she was sensitive to palpation of her longissimus and iliocostalis muscles associated with L2-3 (approximately BL 23 and BL 52). She was reactive to superficial/middle gluteal palpation bilaterally. Although flexions were not performed, and no lunge line was available, she exhibits intermittent lameness on her left forelimb while walking and occasionally while trotting as well. 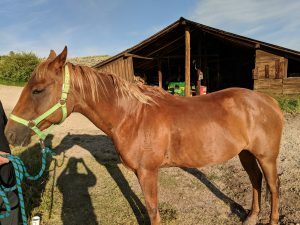 Her neck and back are very stiff and with ground work and while riding she is reluctant to bend at all through her neck or back and instead rotates her body around her forelimbs. Poor Saddle fit resulting in neck, and shoulder soreness (impingement on shoulder blade and subsequent reactivity of associated musculature) as well as back and gluteal sensitivity, soreness and discomfort. Other differentials include distal limb degenerative joint disease, soft tissue injury or neoplasia resulting in neck/back pain. Ideally, a full lameness examination as well as radiographs of her tarsal joints and neck to look for signs of degenerative joint disease and osteoarthritis would have been performed. Due to overt signs of poor saddle fit- such as girth sores, limited capacity for further diagnostics, and noted effects which mostly follow from poor saddle fit-that is the most likely diagnosis. As this was the first acupuncture experience for Dreams, I started with generally well tolerated points to place my needles. They were centrally located points which-had more time been available-I would have further targeted other identified trigger points. 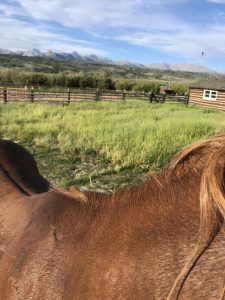 As I believe saddle fit was a consistent cause of her current shoulder, back, and girth soreness I focused heavily on owner education for saddle fit to improve her functionality and comfort in the longer term. The needle placement that was chosen targets connective tissue and muscle spindles directly to decrease inflammation (which often accompanies muscle soreness), and upregulate the immune system to assist in muscle repair. Treatment 1 (July 20)- Time: 15 minutes total. -Seirin J Type 0.20 x 30mm- Bai Hui. Somewhat reactive. Not replaced. During the first treatment, a priority was placed on a positive experience. GV 14 and Bai Hui are centrally located and tend to be tolerated well. Dreams was mildly reactive to placement of Bai Hui, and ended up moving away from the needle. It was not replaced. GB 21 was placed as it is generally well tolerated and, along with GV 14, can assist with forelimb pain and pathology. GV 14, and GB 21 bilaterally were well tolerated. Dreams relaxed into the treatment. Treatment 2 (July 22)- Time: 20 minutes total. -Seirin J Type 0.20 x 30mm- Bai Hui. I felt that 0.2mm was somewhat flimsy for placement in GV 14, and switched to 0.3mm- it felt much better during placement, had better grab and was well tolerated. I continued to apply Bai Hui with 0.20mm due to previous sensitivity. I generally directed my initial needle placement towards well tolerated, central acupuncture points. GV 14 can be used to treat neck and thoracic limb pain as well as immune dysfunction. Bai Hui can help treat back pain. GB 21 can address thoracic limb dysfunction and BL 13 was a specific trigger point that Dreams had (right side worse than left side), and it can also help address any respiratory issues present as well as thoracic limb pain. Treatment 3 (July 30)- Time: 10 minutes total. I enjoyed trying different needle gauges. I found 0.30 to be very well tolerated in GV 14 and provided better placement and more grab on the associated tissue. I continued to use 0.20mm for Bai Hui since it was previously well tolerated. Since Dreams was more worked-up and a bit anxious during this treatment, I placed GB 21 bilaterally and left them in while I worked on massaging some of her other trigger points bilaterally (specifically BL 13, TH 15, BL 54). Dreams’ myofascial examination findings are most likely directly related to poor saddle fit. The tenseness in her back and dorsal aspect of her shoulders is likely a direct relation to shoulder impingement as well as a poorly fitting saddle with a lot of weight and an inexperienced rider. Even her gluteal and more ventral reactivity is likely associated to spinal nerves which are being affected and direct girth trauma . Dreams’ responded well to acupuncture, and although she showed mildly increased range of motion and decreased musculoskeletal reactivity throughout her acupuncture treatments, I think she would have improved more dramatically given an increased number of sessions as well as more extensive therapy. She likely would have benefited from electroacupuncture and laser therapy as well. 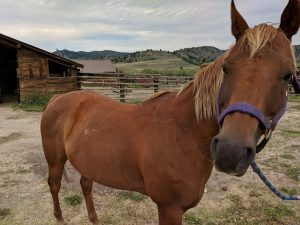 Due to limited time, and her primary issues being largely secondary to poor saddle fit, this was the focus for owner education moving forward. Some basic activities and stretches- such as engaging her abdominal muscles, forelimb stretches and carrot stretches before a ride may help achieve the goal of tightening her abdominal muscles and allow more movement into her affected muscles . It was helpful for me to review and her owner to become educated in saddle fit and begin to fit the saddle to the horse rather than fitting the saddle to the rider. Girth pain (“girthiness”) can cause behavioral issues-especially when dealing with inexperienced guest riders. A wider, padded girth should be tightened incrementally while not overtightening. A mounting block can decrease saddle movement laterally and can help decrease discomfort while mounting . After evaluating saddle placement, it was evident the saddle was being placed too far forward and impinging on shoulder range of motion. The owner was educated on saddle fit basics including tree width, wither clearance, point angle, tree angle and pressure, panel pressure, gullet clearance and overall length as well as assessing sweat patterns (dry spots) for indications of pressure points. Saddle placement was reviewed- slowly rocking the saddle into place then cinching it up slowly. Due to limited availability to perform acupuncture at this point (secondary to distance), education on saddle fit will likely provide the best long-term opportunity to minimize discomfort. I enjoyed working with Dreams and educating her owner. I also enjoyed experimenting with different gauge needles throughout- it further informed my acupuncture practice. Bidstrup IS. The Medical Acupuncture Web Page. Girth pain, a common cause of suffering, poor behaviour and occasional reduced performance in saddle- and harness- horses. July 1999. Available at: https://www.med-vetacupuncture.org/english/articles/equine.html. Accessed November 21, 2018. Muhonen P. Saddle Fitting for Veterinarians. Curacore- Veterinary Medical Acupuncture 2018. Gellman K. An Integrated Approach to Diagnosing and Treating Back Pain in Horses (from Proceedings of Conference on Equine Sports Medicine and Science, Cordoba, Spain, 1998). www.equinesportsmed.com. Available at http://www.equinesportsmed.com/Equine_Sports_Medicine/Publications_files/CESMAS%201998%20Abstract.pdf. Accessed November 20, 2018.